I'm so excited to start off the week by presenting a $400 giveaway sponsored by Beso! Above are a bunch of "ideas" I created for the winner (and, let's just say, that I wouldn't mind if any of these "ideas" leaped into my own shopping cart). They're also linked below. 1. Jump over to Beso’s facebook page and 'like' them. 2. Leave a comment below so we can choose someone at random! *Giveaway is open to US residents, 18 and older. Contest ends 11/3/11 at midnight Pacific time. One entry per person. Good luck! 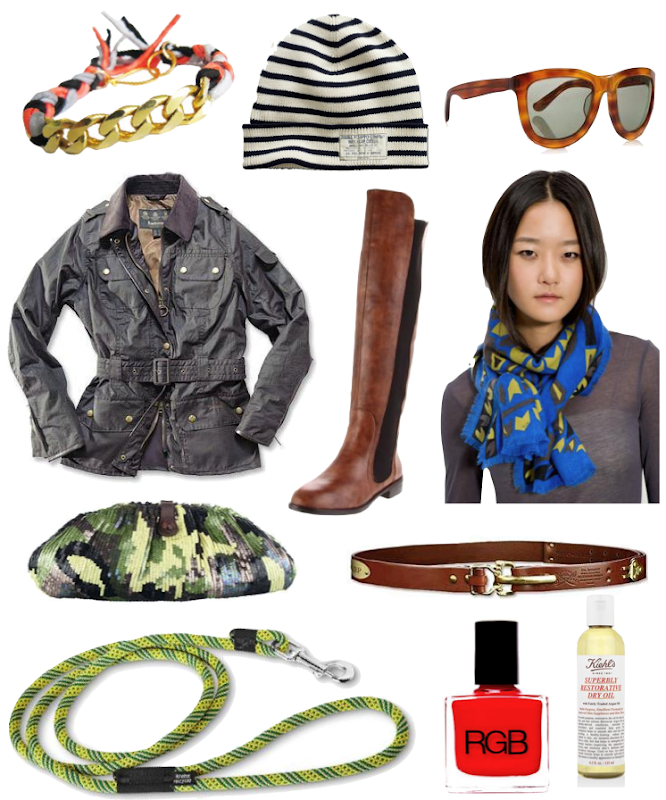 Ariel Gordon silk curb bracelet ($108); RRL striped watch cap ($85); The Row curved-square sunglasses ($325); Pucci "Wild Winter" scarf ($390); Report Women's Basta Boot ($150); Barbour Flyweight HQ jacket ($399); Alexis Bittar camouflage clutch ($230); Col. Littleton cinch belt ($103); Keihl's Superbly Restorative Dry Oil ($42); RGB "Too Red" nail polish ($14); Eddie Bauer Krebs Recycled Leash ($20). Awesome! This would make my year. I would be forever grateful if this opportunity leapt into my arms. I would love for some new winter digs right now! i'll keep hoping! Holy, whoa. What an awesome collection of things. Certainly crossing my fingers tonight. Oh my goodness - great giveaway, and great suggestions! Love BESO. I would love to lose control updating my winter wardrobe! Would love to have this! So many fun things! everything at beso is so drool worthy...could definitely knock out $400 buck there. I'm swooning. If I were so lucky, those boots would be mine. oh.. my dear. gorgeous stuff. really gorgeous stuff. I like, I like! Those boots! They will be mine. Oh yes, they will be mine. I follow!!! those sunnies are dreamy! This is an amazing giveaway!! what a fantastic way to start the week! Random, swing in my favor please! This would make me SO HAPPY!!!!! Awesome giveaway! I love all of the items you selected! Good lord, that belt! Get in my closet, you. Love this blog!! Thanks for this giveaway! Excited!! Consistently great blog... I'm so excited for the book and I love beso! What a great pairing. So many great things to covet. I liked it!!! Because I LOVE this. great... why do i live in sweden, again? Love your blog!! This is so awesome. Crossing my fingers! Keeping warm, dry & cute! New coat-New coat-New coat! I've been wanting to redo my wardrobe for a while, and winning this would help get me to explore my own sense of fashion, thank you for this giveaway! Keeping warm, dry & cute! New coat--New coat--New coat!! Overdue for an update. This would do it. I liked beso on fb and would LOVE to win in real life! So many things that I want! Oh my goodness!! Everything looks fabulous!! Pick me pick me! I <3 BESO! Oh my gosh I would looove this!! Great blog - and great site! Thanks for the tip! RGB nail polish! Sign me up! I entered! This is SO exciting! Great contest! Love the Barbour jacket and watch cap combo! Sweet! The hardest part is narrowing it down to just $400 worth! The dog and I could use a late fall upgrade! BESOme mucho, darling. Excellent picks! Awesome! This would be amazing! I love the scarf and boots! Everything is so great looking and functional. Love it all! love love love. all of it. amazing. I love the hat! What an amazing giveaway. I can dream! Thanks for the inspiring blog. WOW! Awesome! I "liked" their page. What a cool giveaway! Oh boy, would I ever like to win this! fingers crossed! this would make my day! Yes! So much cute stuff. Love tomboy style and beso! Keeping my fingers crossed. Would love all of it! Thanks for the opportunity! great giveaway! i love your choices, too- of course! I could definitely have fun with this!! Ah, what are my chances?! Fingers and toes crossed. so many great items I'd want! would love to win the giveaway!!! What a treat! Love everything! Crossing my fingers! This is a fantastic giveaway. i truly love this blog and would very much appreciate the giveaway! OOOh! So many wonderful items! Ooh! So many wonderful products! This is incredible. I don't even know what I would do with myself if I won, but it would be amazing. LOVE the glasses and the bracelet! Eek, what an amazing giveaway!!! I 'like' Beso on facebook. i so need a pick-me-up. a shopping spree would certainly do that! Yeah! I hope its me! YAy! I hope its me! This would be so fabulous! Nthank you! i love your site! i check it every day. i would love to win this giveaway! wow. i've never heard of them, but everything looks amazing. thanks for introducing me to a new brand! My closet has it's fingers crossed! can i have one of each? lurve!!!! Oh my gosh. -twitching- Too-much-cool-stuff overload! Such great stuff! Would love anything posted!! Such a great giveaway! I love the cape on their facebook page. Anyone carrying Col. Littleton is a friend of mine! Love it! Thanks for hosting this awesome giveaway. Oooh! Lovely giveaway, I would die for some Kiehl's and a new leather belt. my dog chapin loves the leash! Ahhh! This would be amazing! Love all of this gorgeous stuff. Tomboy Style has become my new daily read. Love the inspiration. Thanks! Great giveaway! Would love to do $400 in damage!! so in love with the scarf and jacket...thanks for the giveaway! YAY, new clothes!!! Pick me, pick me! I could do some serious damage, that scarf is amazing. Eep! I liked their page. This would make my entire year magical. This is awesome cause it totally fits the site's aesthetic. Nice partnership!! Oooo - lovely! Would be a thrill to win.